If you’re familiar with a pack of playing cards, then you will feel right at home with the Kings of Cash online pokie. Like the title suggests this game is about kings and cash, but whose cash? Yours of course! The game features the four kings, hearts, spades, diamonds and clubs; equipped to help you win the cash up for grabs. Brought to you by giant software provider – Microgaming. The pokie lives up to the Microgaming standard of excellence and is available in free play and real money mode. This is a five-reel online pokie, the five reels are blue and set against a dark background. If you’re familiar with Microgaming pokies then you know you’re in store for a royal online gaming experience. You can look forward to cutting-edge graphics in vibrant royal blues, reds and gold! As if the title and graphics are not enough to convey the theme of this game, Microgaming solidified the royal theme with an aristocratic soundtrack. Other symbols include moneybags, dazzling treasure chests, coat of arms, glorious crowns and golden thrones. The most important icon is the wild – Kings of Cash logo. Consequently, it is the highest paying symbol at 5,000; when you land five matching logos. The pokie also features two scatters, the crown and dollar sign. You can trigger a free spins bonus by landing three or more-dollar signs. By landing three or more crown icons, you activate the game’s main bonus round. 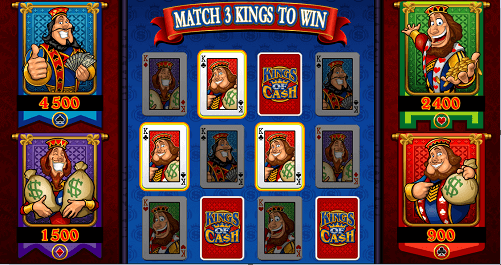 During the Kings of Cash bonus, you will need to select cards to reveal three identical king icons. When you match three king icons of the same suit, you win the equivalent payout! In addition, all the symbols are animated when they form a winning combination – heightening your online gaming experience. You cannot think about royalty and not link money to that thought; because money follows royalty. This online pokie exudes royalty in every way, especially when it comes to the winning potential. We say – check out our list of online casinos for Australian gamblers, pick one and head straight for this game.